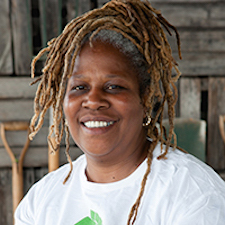 Karen Washington, a graduate of the CASFS Apprenticeship training program in organic farming and gardening, will present a keynote address at the 2019 Ecological Farming Conference. The Center for Agroecology & Sustainable Food Systems (CASFS) will be well represented at the 39th annual Ecological Farming Conference, one of the nation's premiere gatherings of sustainable agriculture and food systems advocates. The conference takes place January 23–26 at the Asilomar Conference Center in Pacific Grove, California. Karen Washington, a graduate of the UC Santa Cruz Apprenticeship in Ecological Horticulture, founder of Rise & Root Farm, and co-founder of Black Urban Growers, will deliver an opening keynote at 8 p.m. on Jan. 23 in Merrill Hall. Joji Muramoto, associate researcher in environmental studies who has spent more than 20 years partnering with farmers to pioneer soil-management strategies for organic farming, will co-lead a workshop on Organic Soil Fertility Management for Vegetables and Strawberries. Tom Broz, founder of Live Earth Farm, will be honored as a "Successful Organic Farmer"
Four of the six presenters during the Jan. 23 preconference, "Advancing Equity in Ecological Farming," are apprenticeship graduates: Kellee Matsushita, assistant manager of the Farm Garden at UCSC's Center for Agroecology and Sustainable Food Systems; Nancy Vail, co-founder of Pie Ranch in Pescadero; Karen Washington of Rise & Root Farm; and Berkeley-based community food activist Joy Moore.